“The armillary sphere is an instrument that models the celestial sphere with respect to the horizon of an observer. It is made up of rings (known in Latin as armillae) representing the great circles on the celestial sphere such as the horizon, the celestial equator, the colures and the ecliptic. They can be adjusted to any latitude and can be used either as an instrument of observation or as a tool of demonstration…. 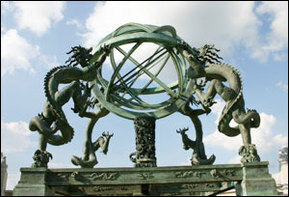 The Chinese armillary sphere in front of the door to the Guesthouse is a replica of an antique model. Note the dragons supporting the sphere. It is cast in bronze and was donated by a devotee of the Temple.